The State of Massachusetts passed a criminal justice reform law that goes into effect on October 13, 2018. This law amends the restrictions on the criminal history questions that can be asked of applicants for employment. The new requirements includes: a limitation of 3 years for asking about misdemeanor crimes and a prohibition on asking about expunged records. Justifacts is updating the authorization form used in our system to comply with this law. You may omit any record that was sealed, or a first conviction for any of the following misdemeanors: drunkenness, simple assault, speeding, minor traffic violations, affray, or disturbance of the peace, or any misdemeanor conviction where the date of the conviction, or the completion of any period of incarceration resulting from the conviction, occurred more than three years prior to the date of this employment application, unless you were convicted of any crime during that same three-year period. An applicant for employment with a record expunged pursuant to section 100F, section 100G, section 100H or section 100K of chapter 276 of the General Laws may answer ‘no record’ with respect to an inquiry herein relative to prior arrests, criminal court appearances or convictions. An applicant for employment with a record expunged pursuant to section 100F, section 100G, section 100H or section 100K of chapter 276 of the General Laws may answer ‘no record’ to an inquiry herein relative to prior arrests, criminal court appearances, juvenile court appearances, adjudications or convictions. 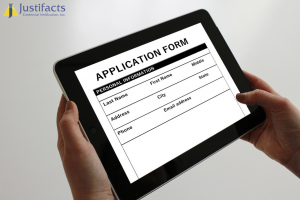 If you are using our Applicant Portal, there is nothing you will need to do. The portal system will automatically update! And, this will include the new language for those clients set up to ask about previous criminal history. If you are not using our Applicant Portal, you will need to update any authorizing documents. These must include similar language if the documents ask about previous criminal history.